Silver shoppers save the high street? 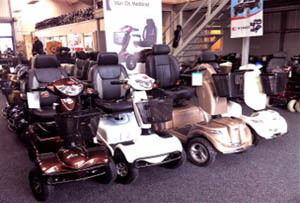 Struggling retailers should turn to mobility scooters and hearing aids if they want to prosper, suggests a new report. Hardly a week goes by without more news of the dismal state of the British high street, beset on all sides by slick new online rivals, rising rent and rates and declining footfall. But despite the record shift to virtual shopping, and the weather (which, hot, cold, wet or dry, is always the wrong kind for retailers) there is apparently at least one sector where traditional bricks’n’mortar outfits are still cleaning up. According to research from the Local Data Company, shops catering to the growing spending power of the over 65s are booming. There has been a rise of no less than 17% in the number of stores selling hearing aids and an uptick of 2% in those dealing in mobility scooters. Now 2% might not sound like much but with shops in more established markets putting up the shutters all across the country, it’s not to be sniffed at. Plus presumably there is a multiplier at work here too - every mobility scooter sold is one more consumer on the loose, able to get round a whole variety of other stores and spend, spend, spend. It’s Christmas after all, why not treat yourself to another pair of elasticated slacks or a family sized bag of Werther’s Original? Unless, like the ‘confused pensioner’ reported in last week’s Stoke-on-Trent Sentinel, you make a wrong turn on the way to the shops and end up flat out on the dual carriageway at a giddy 8mph. Oops. The serious point here - yes there is one in there somewhere - is that the demographic shift towards the elderly in the UK is bound to have economic ramifiactions like this. Especially as real incomes for the working population continue to fall, while many OAPs remain - for now - protected from the worst effects of the recession by their copper-bottomed final salary pensions.